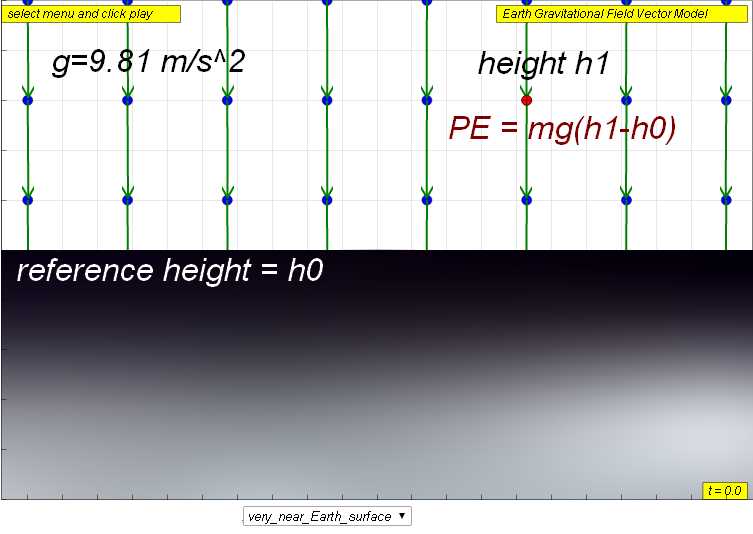 In the topic of Work, Energy & Power, the calculation of gravitational potential energy (GPE) is determined using the expression, mgh, which assumes that the gravitational field strength g is roughly constant, but a more robust formula is required for varying field strength, say when sending rockets which travel into outer space from the surface of the Earth. 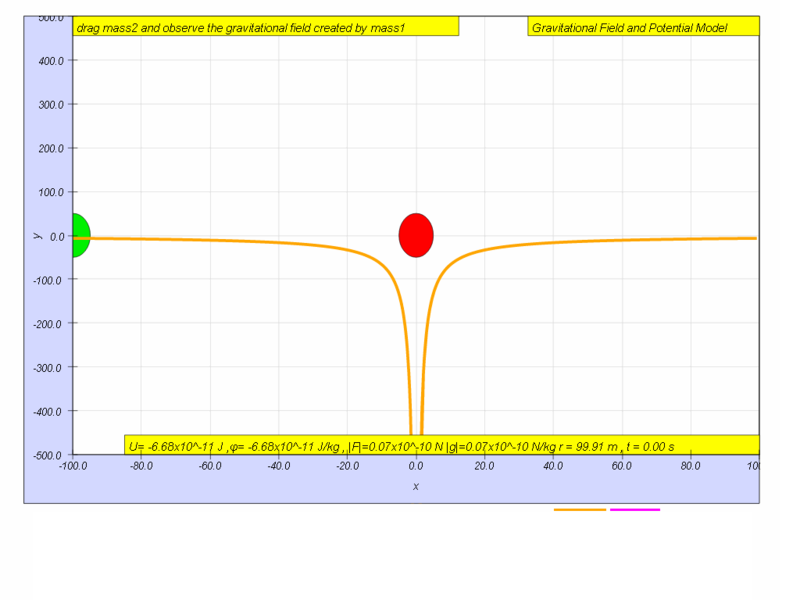 where ΔPE or ΔU is the gravitational potential energy possessed by mass m measured from the reference height h0 , g is the gravitational field strength created by source mass M.
h or Δh is the change in the height (h1 - h0 ) of the mass m.
Calculate for the case when r = 50 m.
has only negative value due to the reference potential equal zero U = 0, position is defined at position r = infinity, ∞, and gravity is attractive which means the lowest potential position is at the centre of the source mass M.
Now, this leads to the need to define gravitational potential energy. The gravitational potential energy (U) of a mass m at a point (due to the gravitational field set up by mass M ) is defined as the work done by an external agent in bringing the mass from infinity to that point r distance away from source mass M.
To further understand the meaning of this definition, let's start with the definition for work done on external agent, where WD = WD by external agent. 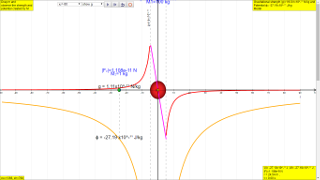 Substituting the formula for force F and working out the integration, it can be shown. Notice the formula for this work done by external agent is equal to the U. To understand this definition, we can use the simulation with some imagination. 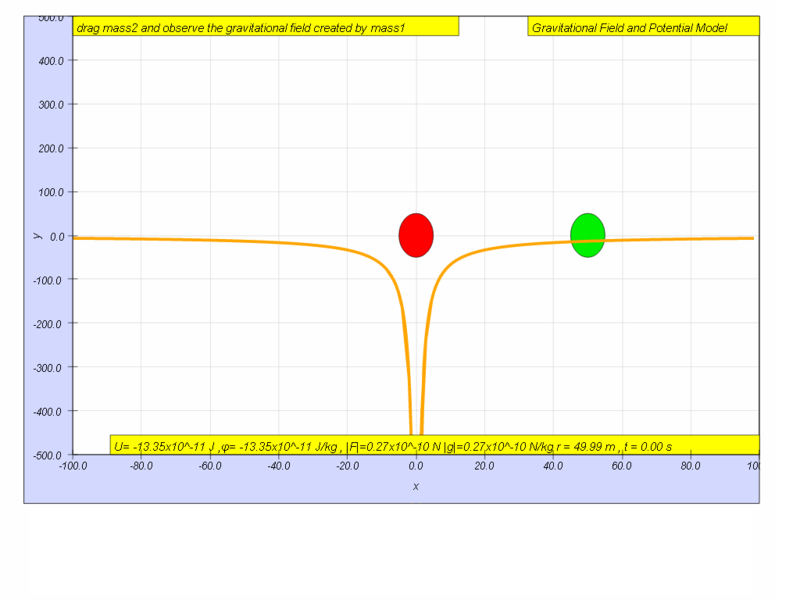 Let imagine a force pointing towards infinity away from source mass M, acting on this test mass m, the potential energy of m at this point would be therefore the work done by this external force. which means that the work done by external force is equal to the gravitational potential energy (Ur) since U∞ = 0. The intent of these activities is to allow students be like a student-scientists and collect their own data to form an understanding of potential energy. Calculate the change in U from r = 100 to r = 50. Check the "your model" checkbox and a teal color line appear. For example if the model is , U = - G m M r , key in -6.67*1*100/abs(r) and observe the closeness of fit of the orange color line (data collected) versus the teal color line (model proposed). Suggest with reason why you think the model -6.67*1*100/abs(r) is accurate. Note that the model already has a multiple of x10-11 so there is no need to key it.